I’m in the slightly maybe category right now. This is hysterical. I prefer to think of myself as immature. That’s a pretty safe observation on the part of you and Alfred. welcome to my world…I get called childish daily…absolutely daily! 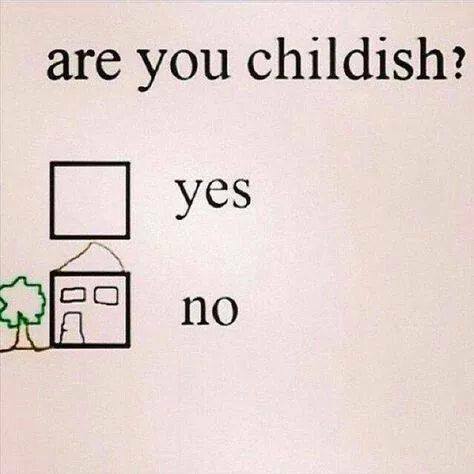 I can be childish on and off depends on the situation but so what. We should all remember to try to be a little “childish” To never stop asking why, to try new ideas, just have fun being in the moment and looking at life with a child’s curiosity. Thanks for the reminder, it’s time for me to play. I choose no, because the picture tells me that’s the right one. Now that my children are all educated, married and raising families. I have nothing stopping my childish thoughts from running amuck. It’s great to be content and let the child like thoughts dance their dance within me. That’ll be a yes from me, but I can be grown up when needed! I’d probably vote “no,” because to me, there’s a negative connotation to “childish” and a positive one for “childlike.” But that’s nitpicking.